Petersburg: What a lovely place! We have heard for years what a pretty and interesting town this is, and several people we've met on our trip have suggested it as a good place to over-winter the boat. After walking the town today, we're at least considering that strategy. Petersburg has 3,100 residents, a public radio station, an arts community, lots of services for the boater, and very friendly residents. 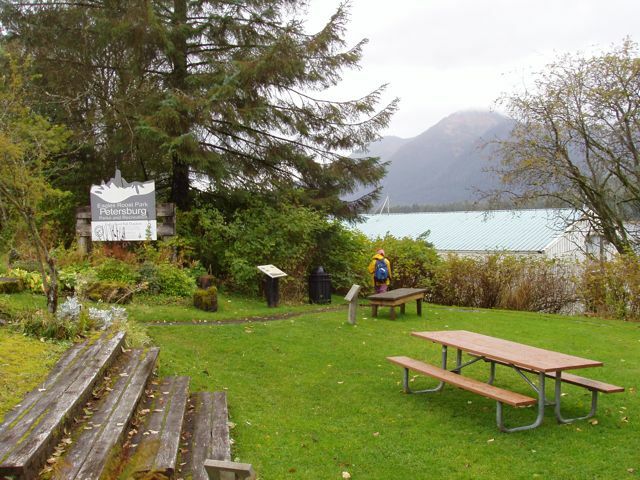 Its nick-name of "Little Norway" stems from its Norwegian roots: in 1897, Peter Bruschmann, a Norwegian fisherman, decided that this location at the northern end of Wrangell Narrows was a good spot for a cannery, given the ample salmon and the icebergs to be found in the adjacent Frederick Sound. 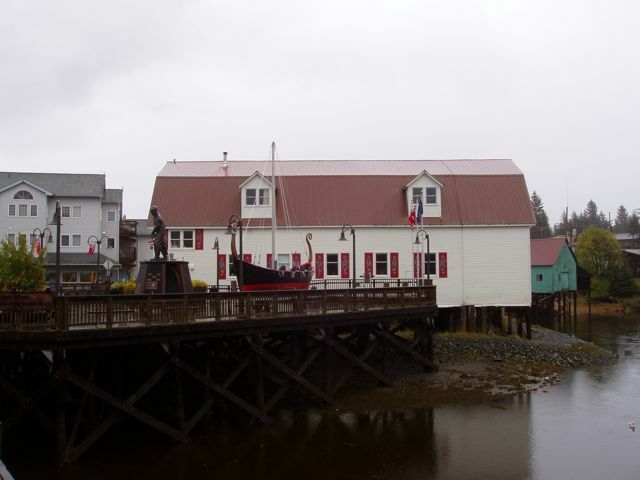 The cannery became a town settled by even more Norwegian fisherman and Chinese workers. 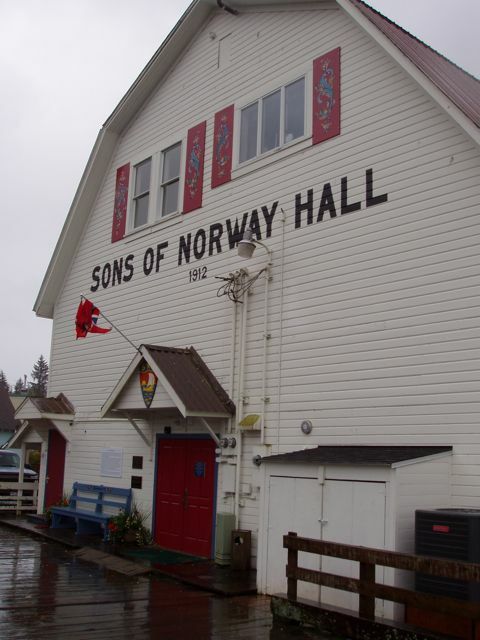 It has a Sons of Norway hall built in 1912 and a very moving fisherman's memorial. It also has a nicely sheltered harbor system which we came to appreciate as a gale and then a full-on storm passed through the area. 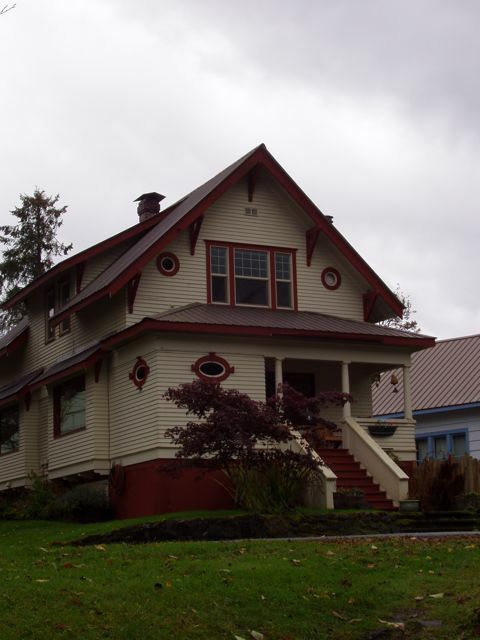 The city was incorporated in 1910, making 2010 its centennial. 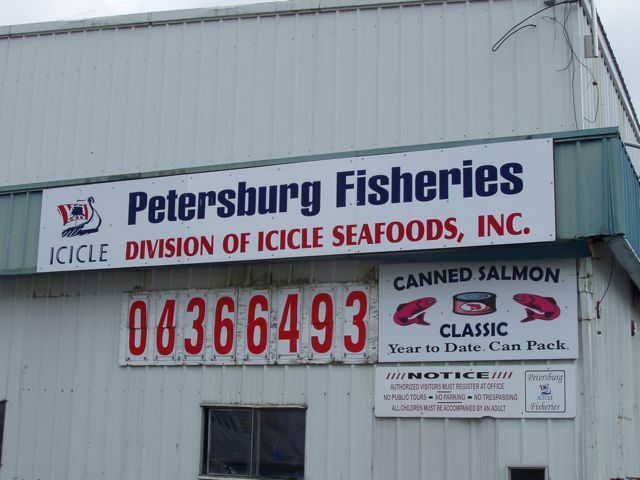 This cannery is the successor to the one started in 1898 by Peter Bruschmann, founder of Petersburg. Eagle Roost Park overlooking Wrangell Narrows. Notice the windows designed to look like boat port-holes. 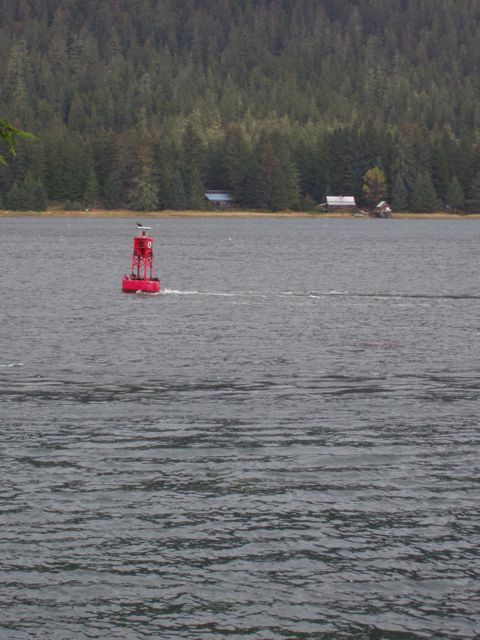 A sea-buoy marking the northern end of the Wrangell Narrows. The tide here flows so fast that this passage resembles a river more than a stretch of ocean. Here the tidal current is flowing from left to right: notice the wake on the leeward side (on the right in this photo) of the buoy, and of course the cormorants sitting on the buoy. 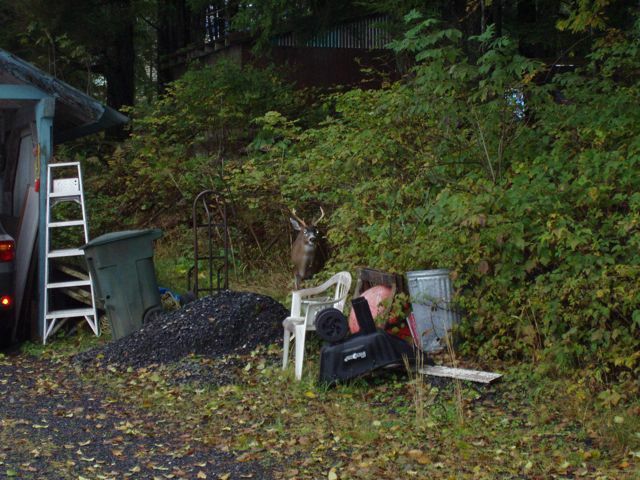 At first Bill (and Conni) thought this was an interesting deer model in someone's front yard. Then it moved. 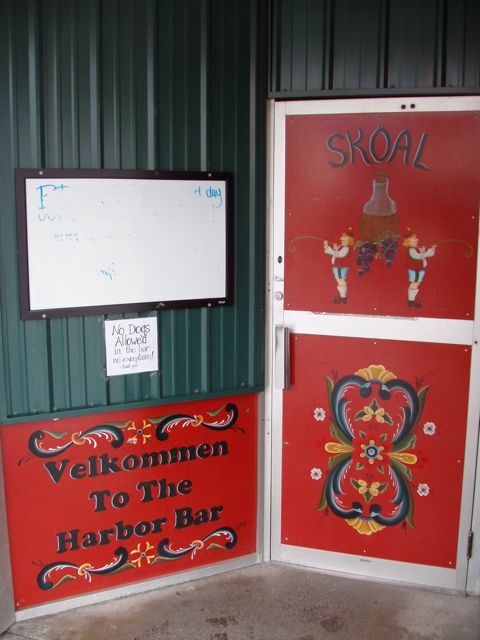 The local fisherman's bar, Petersburg style. 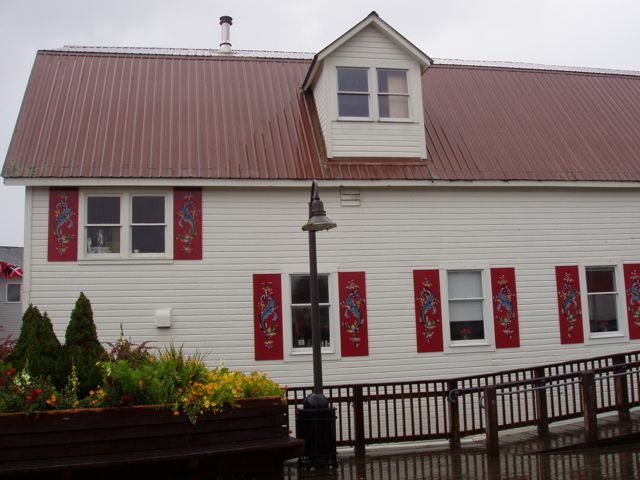 This pretty rosemaling painting is seen on many houses and businesses here. The Sons of Norway Hall, built in 1912 and listed on the National Register of Historic Places. Valhalla, a modern 30 foot viking boat. 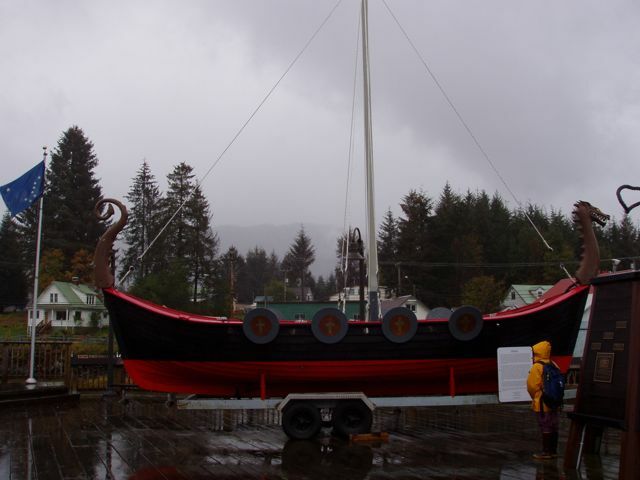 The Sons of Norway Hall again, with the viking ship Valhalla and the fisherman's memorial in front. One of the three small harbors in Petersburg. It's raining - they call this a rainforest for a reason! 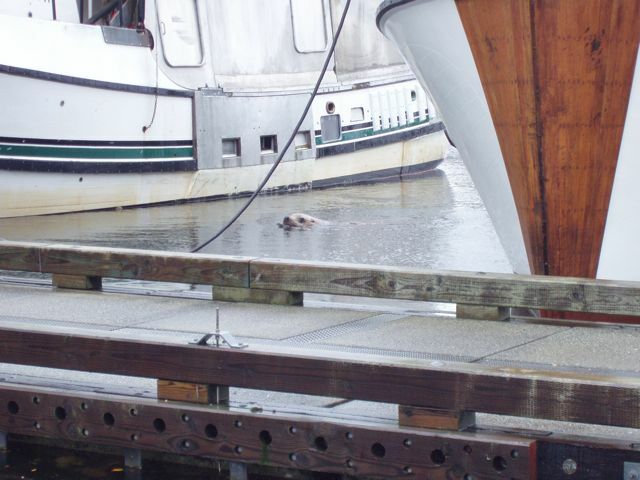 A sea lion swimming in the harbor. The wood trim on the bow of the fishing boat to the right is there to protect the hull when the anchor is raised. As on this boat, it is often lopsided, with more of it placed on the side on which the anchor gets raised. 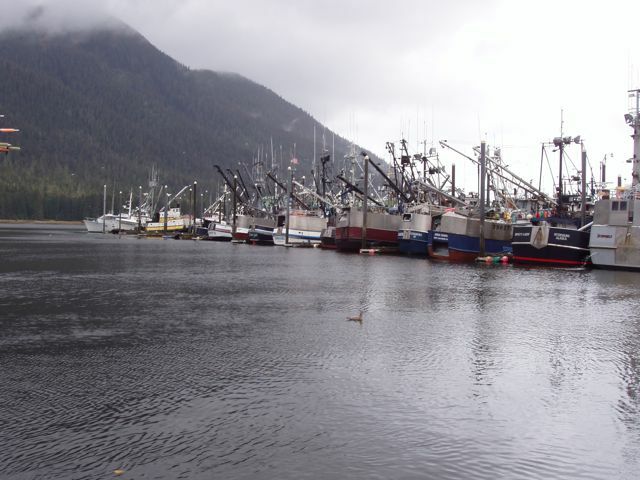 A row of large fishing vessels in one of Petersburg's harbors. 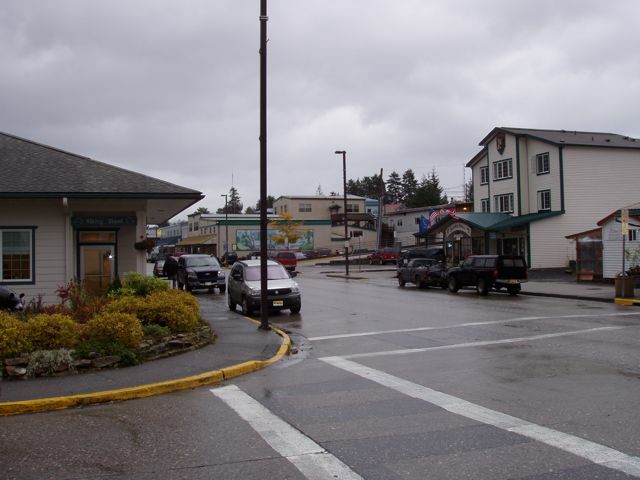 This town's fishing industry is alive and well; Petersburg has not been taken over by industrial tourism, in part because large cruise ships cannot negotiate Wrangell Narrows. Another sea lion turning to give us a stare. 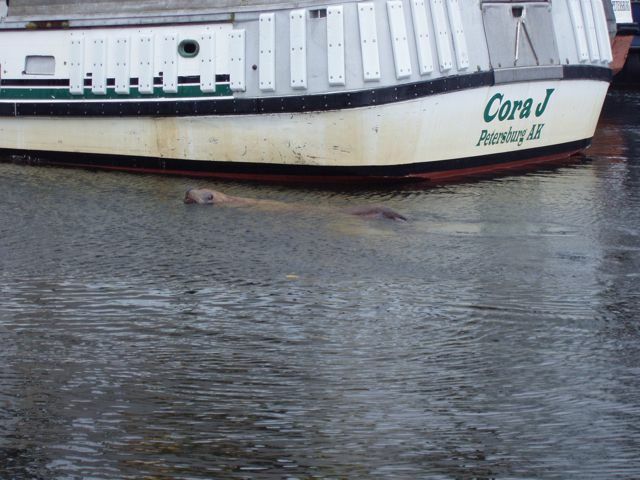 These guys are much, much larger than the harbor seals we're used to seeing in Seward. 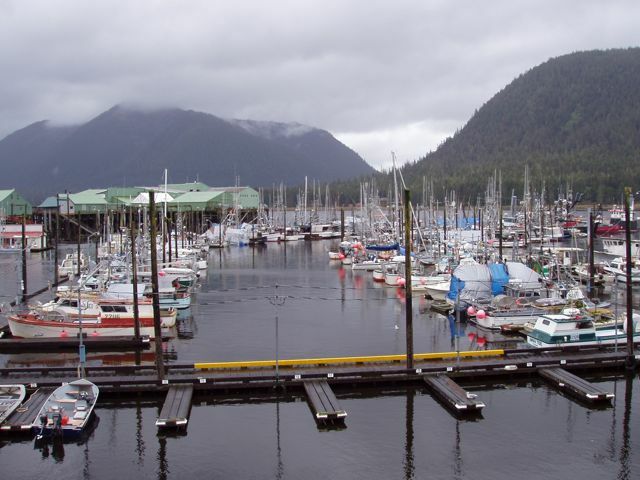 Another view of a row of big, steel-hulled fishing vessels (seiners, probably) in Petersburg's South Harbor. 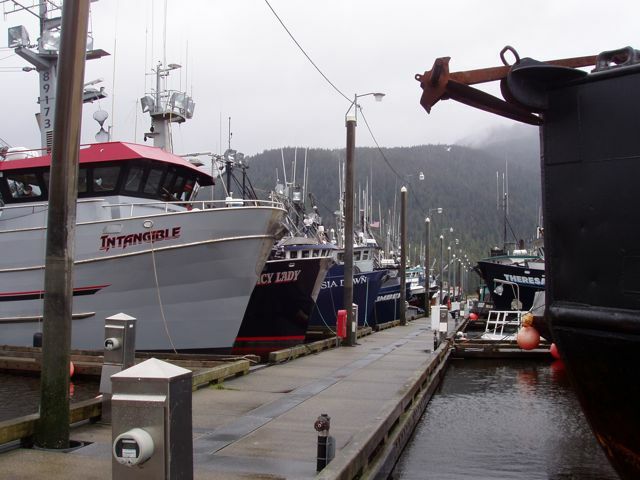 We've grown so used to seeing the small, one-person wooden fishing boats that are used for troll fishing throughout southeast Alaska that these big boats caught our eyes. 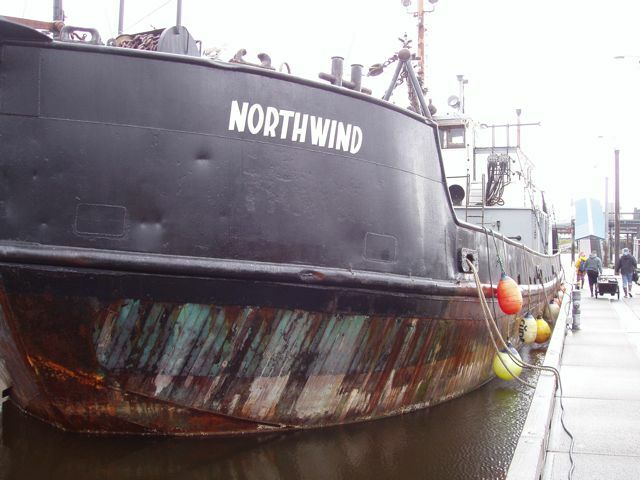 An old and oft-patched wood hull with steel topsides. Downtown Petersburg has quite a bit of public art, including the mural on the side of the building in the center frame. 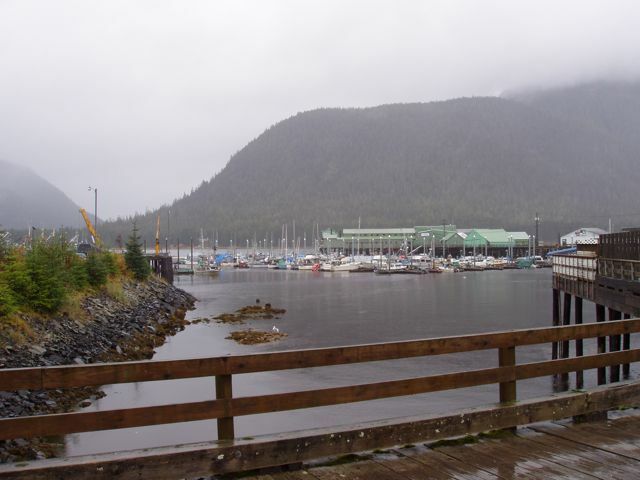 Petersburg's North Harbor, with Wrangell Narrows behind. Here we sit enjoying a sheltered harbor and shore power (i.e. electric heat and as many lights as we care to turn on) while a storm rages. Wings' mast is mid-photo, far in the back. It's early October and the fall colors are out. 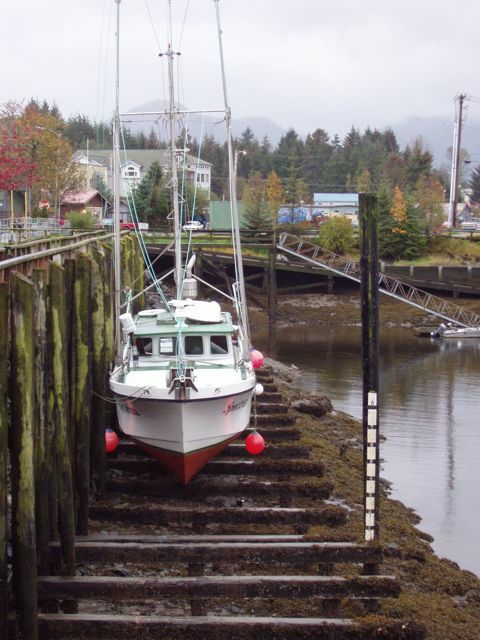 Here a boat sits on Petersburg's grid during low tide. 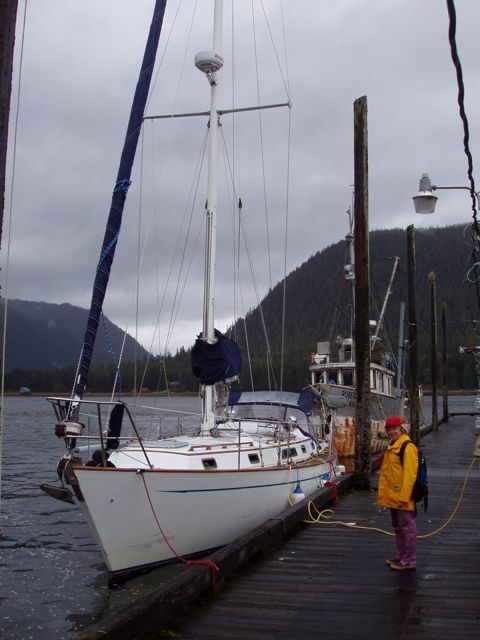 Most harbors have a grid: you drive your boat onto it as the tide is going out and tie up to the pilings, wait for the tide to drop, and then you can inspect the bottom and do quick projects before the tide comes in again and you float off. As is evident from the height of the pilings, Petersburg has those same astounding, 20+ foot tidal variations common throughout much of Alaska. This lovely vessel is owned by our Petersburg friend, Bob Dolan. I'm standing by Wings in Petersburg's North Harbor, modeling my raingear. The scuffs on the bow near water line are from tying up to a mooring buoy a few days earlier. They come off with a bit of elbow grease and Bon Ami, but first there's a new town to explore! A derelict vessel in North Harbor. 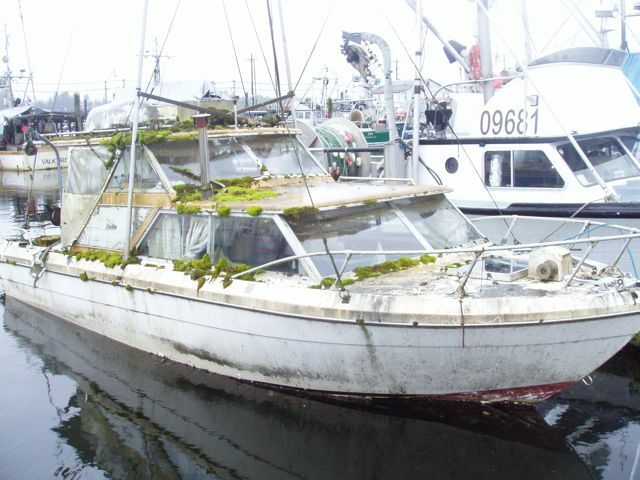 We hate to see boats in this condition. She still has an owner, we were told, but he has lost his investment. We were told that it was the most photographed vessel in the harbor!